Umpteen is a new album from Yorkshire-based folk singer and songwriter, Ray Hearne. From an Irish family who settled in South Yorkshire he has his cultural roots in the traditional Irish tunes of his parents but is deeply influenced by the stories, surroundings and dialects of the South Yorkshire coal and steel communities he grew up in, and in the post-industrial landscape they have become, where he still resides. Following on from the well-received previous album The Wrong Sunshine, Umpteen is a collection of fourteen self-penned songs. As well as bringing in some evocative lyrics, delivered in a warm, rich, no-holds-barred South Yorkshire tongue, there’s also some fine musicians and guest singers performing on this too, including Belinda O’Hooley, Jude Abbott, Greg Russell and Ciaran Algar. Highlights on the album include opening track ‘Moonpenny Hill’, a passionate, powerful folk anthem, bitingly, savagely political but equally full of warmth and humanity. Here, Hearne reflects on the everyday struggles of the 84/85 miners’ strike where, in spite of “bitter the wind from the south” there is the warmth provided by comradely solidarity, supportive sisterhood and thoughts of the coming spring. ‘The Hales of Henry Street’ is written in memory of Private Henry Hale of Rotherham and thousands like him slaughtered in the First World War. Folk listeners will have heard many similar, equally heart-rending, recollections in recent years. But the lyrics eloquently capture both the horrors of the trenches and the impact on the folk back home. Lush brass from Jude Abbot gives the song an evocative, mournful and thoroughly South Yorkshire feel. Whether it’s hard-hitting protest songs about the Thatcher era, wistful memories of growing up or historical tributes to fallen brothers a century ago, the spirit of South Yorkshire oozes out of every groove of this CD with typical honesty, humanity and good humour. Ray Hearne has done his adopted and beloved homeland proud with this fine set of songs. While I certainly know the output of Greg Russell & Ciaran Algar pretty well these days I was not familiar with Luke Jackson’s work at all. Jackson walks on to the stage and rich, bluesy, distinctive vocals immediately fill the room. With some dexterous guitar playing he gives a rootsy, acoustic blues feel to the contemporary singer-songwriter genre and is an immediate hit with the Cecil Sharp audience. Greg Russell and Ciaran Algar then join Jackson on stage to provide lovely added harmonies on his final song. And after a short interval Russell and Algar return, sans Jackson, and we move from contemporary singer-songwriter to traditional folk duo. Winning the BBC’s Young Folk Award in 2013 (the same year Luke Jackson was a runner-up, incidentally, and how they first met) the duo appeared to arrive fully formed with an incredible degree of musical maturity at an impossibly young age. But they’ve continued to go from strength to strength and are now on to their third album. Russell’s rich and expressive voice simply oozes with character and passion while Algar’s fiddle-playing, always delivered with exquisite perfection, veers from the wildly energetic to the beautifully sensitive. They are touring in support of their new album The Silent Majority, released just last month, and we get to hear a number of songs from that tonight including the title track itself, a cover of the Lionel McClelland song which serves as a warning of the tragedies that unfold when “the silent majority stays silent”. Another highlight is George, a great Glasgow-based drinking song, as well as a beautiful version of Rolling Down The Ryburn. It’s not just about the new album though and we also get some well-chosen favourites from their first two albums including The Queen’s Lover, written when a 17 year-old Russell was studying for his history AS level, and Away From The Pits, written by Ciaran Algar’s father, Chris, a homage to his native Stoke On Trent. Luke Jackson, who was joined by Russell and Algar for the final song of his set, returns the favour and comes back on to accompany the duo for their last song: three talented musicians, two very different acts but one highly entertaining evening. Another very successful night for Cecil Sharp House. The folk world thrives on the sort of musical partnerships and band formations that are perhaps far more promiscuous than in the rock world. Part of this is down to simple economics. Folk gigs rarely command the sort of fees that are ever going to allow an artist to tour for a couple of months then spend the rest of the year snorting cocaine at some sun-kissed poolside in LA (even if they wanted to). So it is not at all uncommon for folk artists, even as part of a really well-established project, to work in different permutations with different sets of musicians throughout the year. But much of it, I suspect, is also down to a simple and addictive love of playing and singing. Both of tonight’s performers have made a real impact in recent years in well-established duos, Greg Russell with Ciaran Algar and Rex Preston with Miranda Sykes. However, explains Greg, with himself and Rex both living fairly close to one another in Devon they soon evolved from drinking buddies to playing together purely for fun – and now to touring together. Tonight at Green Note it is only their second show together but an absolute treat. Audiences familiar with Greg and Ciaran would recognise the magnificent “Davy” from The Queen’s Lover album. But beyond that it’s a completely different set of tunes and songs: a nice mix of self-written compositions, covers and traditional material. As well as impressively beautiful mandolin-playing throughout the evening, Rex sings a couple of songs, too. And while Greg’s musical background is steeped in folk from a young age, Rex’s influences are far more diverse, and the mix of sounds and styles from the two make for a great combination. Whilst the irreverent banter between Greg and Ciaran is always hilarious and always an essential and welcome part of their live show, in a different format like tonight we perhaps get to hear a little more about what makes Greg tick musically. He tells us he could just about cope if he was never able to play guitar again but couldn’t imagine what he would do if he was never able to sing again. And what a singing voice it is. If you listen to the lead vocals of a young Simon Nicol on the early post-Sandy Denny Fairport albums, for example, his delivery sounds somewhat hesitant compared to the magnificent gem it would become later in his career. With Greg Russell, it’s a completely different kettle of fish altogether. There is character and richness and depth to his voice, such that would take many of even the greatest singers years and years to develop. So let’s put aside the qualified labels like “rising star” and “enormous promise” – I’m going to nail my colours to the mast and call it for Greg Russell as the country’s finest folk singer of his generation. I look forward to seeing both Greg and Rex back in their more usual partnerships in the not too distant future. 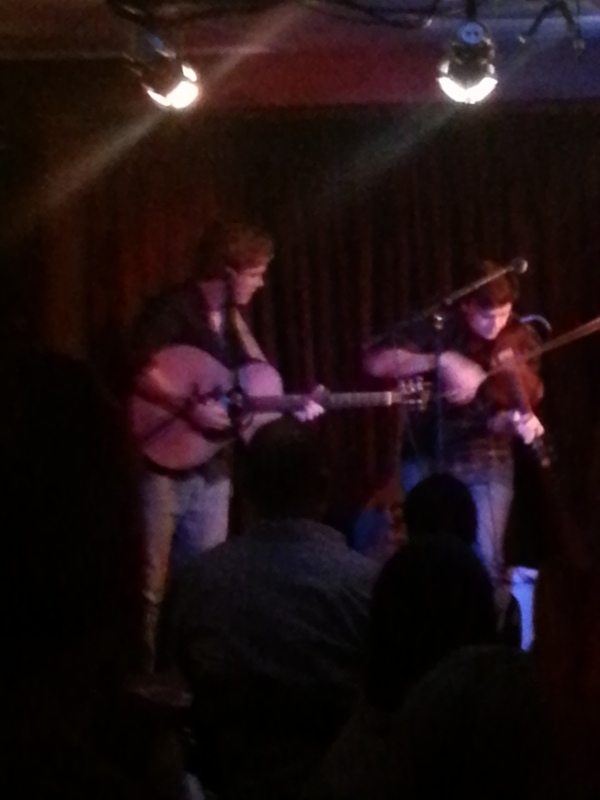 But tonight has been a fruitful and enjoyable product of the folk scene’s continuing musical promiscuity. Did You Like The Battle Sir? Winners of the 2013 BBC Young Folk Award, Greg Russell and Ciaran Algar were well received by the large crowd when I saw them at Cropredy last summer and picked up another BBC folk award this year. Their debut album, The Queen’s Lover, came out two years ago and this has recently been followed up with their second, The Call, which has been getting rave reviews. Tonight, they are performing at the Green Note, a venue no bigger than the average trendy north -London bistro which is pretty much what it is except that they’ve also built up a reputation for hosting some top folk acts. The gig is a sell-out with a 60/70-strong crowd. They are both incredibly talented musicians. Witty and relaxed on stage, their banter suggests that in a different era they could have been some cheesy 70s TV double act with Russell, the thoughtful, sensitive straight man and Algar, his brash, down-to-earth side-kick. However, musically they are a perfect match. 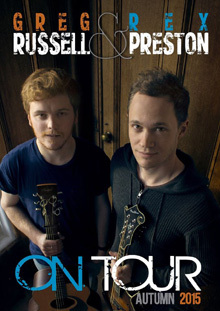 Russell’s beautifully expressive voice and lovely guitar is complemented by Algar’s brilliant fiddle playing, though, as they demonstrate throughout the evening, both are talented multi-instrumentalists. Exceptional musical talent only makes for an exceptionally entertaining evening, however, with a good choice of tunes and songs but, again, they excel. “The Queen’s Lover”, title track of their debut CD, is a song set in the Tudor court that Russell wrote when he was just 17 while revising for his history A Level. “Davy”, Russell tells us, is a song he originally learnt from his father when he was very young, but while at university he sought out the original songwriter’s blessing to change the words and re-interpret it – which he was happy to give. We also get to hear a good selection of material from their brand new CD, The Call. “Away from the Pits”, Algar’s reflection of life and love in his home town of Stoke-on-Trent, is one of those and, again, beautifully played and sung. In what they call their “rock ‘n’ roll moment” both leave the stage for a completely unamplified version of “The Call and Answer” in the middle of the packed room. A great moment in the evening. They encore with their version of “The New Railroad”, a traditional bluegrass song they have put their own unique stamp on and a perfect finish. “Hope you like us!” they wrote on my CD when I queued up to buy a copy from them. Yes. I do!